The Grumpy Penguin*: For All My "Mothers"
Life as experienced by a passionate cynic. 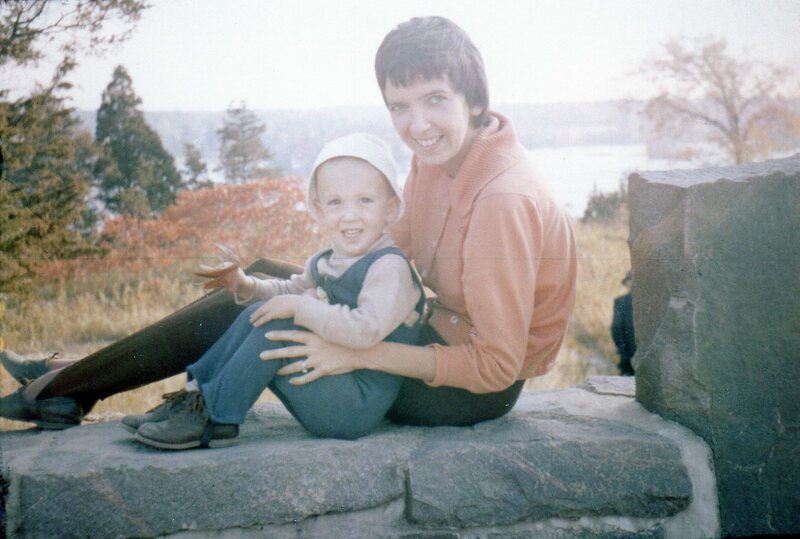 This is a picture of my mother and me when I was nearly 2 1/2 years old. I have no idea where it was taken; if I had to guess I would say it was at my grandparents' (on my dad's side) cottage near St. Jovite in the Laurentians. I can just make out a figure in a black coat and fedora behind us who is probably one of my grandfathers. I don't remember this wall from my days at the cottage but I suppose it could have been demolished before my memories took hold. It's all conjecture, though; the simple truth is I'll likely never know because I am no longer in contact with my mom. We had some very challenging times, my mom and I, as she has suffered from different sorts of mental issues in her life, most of which have gone undiagnosed and/or untreated. For years my brother and I struggled under the weight of these problems until finally we had children of our own and recognized that our relationship with our mother was neither "normal" nor healthy. After years of trying to convince her to get help, I realized that she was starting to have a negative impact on my own children and several years ago—about a decade, in fact—I made the difficult (and yet, not as difficult as it might have been) decision to remove her from my family picture. Close friends from my formative years know that this was a decision that had to be made; I am at peace with it in my soul. It is no longer a "good" or "bad" decision, it simply is what it is. Cards are dealt and you play them the best that you can for as long as you can. Sometimes you really do have to "fold". But don't for a moment think that I grew up without a "mother". On the contrary, I have had so many wonderful "mothers" in my life that I consider myself to be a very lucky man indeed. The terrific mothers of my closest friends did much of the heavy lifting in my upbringing and it's these great and large-hearted women to whom my thoughts turn every year on this day, Mother's Day. There is no way I could list every mom who made room for me in her "brood" through my life, but here are some of the women I am thinking of today with gratitude beyond that which I would ever be able to convey to them. The "post-partum surrogate mothers" of my pre-teen and adolescent years were all very important to me and I loved each and every one of them. Dell Watson (mother of Kemp), Betsy Gordon (mother of Danny) and Dr. Ouida Wright (mother of Michael) were all wonderful moms with whom I had very strong bonds. These were women who always treated me like I was their own son, never afraid to give me a kick in the pants when I needed it—and boy, did I need it often. I have tremendous respect, admiration and love for these women for doing whatever it took to ensure that I always felt the steady hand of a mother outside of the home, even when I wasn't feeling it inside the home. I'll never really know if they had an inkling of how badly I needed a strong mother figure in my life or if their hearts were just that big, but I assume that it was always a little of both. Two of them are no longer with us—Mrs. Watson and Dr. Wright—and today I am also thinking of their sons, dear friends of mine, who are missing them terribly. Then there were the moms I knew later in life, such as Marian Palmer (Steve's mom) and Mrs. Yorke (Stephe's mom whose first name I have long forgotten). I met their sons in early university days and in each case they took me in and let me stay in their homes when I had nowhere else to go in my very late teens, as my own mother's psychoses got worse. In both cases I don't think they were particularly fond of me overall, but that just makes their generosity all the more grand. They knew their sons were great friends of mine and they knew I was in trouble. They could have said "We can't help him, sorry" but neither did. I could never repay these moms in a hundred lifetimes. I have also been very, very lucky with my partner's moms. My late mother-in-law, the other grandmother to my children, was very close to me even after her daughter and I split up as husband and wife. She was devoted to her grandchildren, so much so that she would regularly take a two-hour round-trip on the TTC to come to our house to babysit so that her daughter could work a three-hour shift at the hospital for some extra cash when Tim and Jill were quite young—and she did this three times a week for nearly a year. She could easily have turned her back on me after the separation, but she did not and I am very grateful for that. Then there's my "mother-in-common-law", Evlyn Fortier (Sarah's mom), whom I just think the world of. Sarah and I have struggled through some lean times together but she has always been there, supporting not only her daughter but also me through some of the darkest times of our relationship. I love her dearly and we have a wonderful time on her sadly infrequent visits to see us, or us to see her. These are all very important women in my life and I don't want to take anything away from any of them or their sons and daughters who are so special to me. But if I had to pick the one most important "stand-in mom" from my life, she would have to be Mimi Rose (John's mom), also lost to the world far too young. We had a special bond that was so strong I could easily have been adopted into her family and never missed a beat. I spent as much time as I could possibly get away with at John's house and cottage through my teen years and his mom took every opportunity to have a chat with me, to see how things were going, to make little (or big) suggestions, to listen to my dreams and fears, to be a mom. She always had time for me, even when she didn't have time for me. Many was the visit to John's house where I left him watching television or listening to a record and just wandered his home until I found his mom so I could just hang with her for a little while. I was incredibly lucky in that not only did Mrs. Rose sense I needed to do this, but also John was ok with it. My goodness, the friends I have had in my life are the greatest I could ever wish for anyone. Of all my friends' families, I easily spent more time "sleeping over" at John's than anywhere else, at least through my adolescence. And even as I got older and had less opportunity to visit with Mrs. Rose—because both John and I had our own homes where we would get together—we never lost touch. When my son was born, in 1989, one of the very first cards I received was from John's mom. She sent along a little money to put away for Tim and enclosed an absolutely beautiful note with the card. I had no way of knowing this at the time, but I would never converse with her again: she was in the late stages of cancer then and passed away before I had another chance to see her. I grieved her loss—and still do—as if she was my own mom. When I had to choose people to "emulate" in raising my own kids, her name was right at the top of the list. All of these moms, and more, are whom I am thinking of today and every Mother's Day. I love and loved them all and I know how incredibly blessed I have been to have had so many "moms" in my life. Happy Mother's Day to all the moms, surrogate moms, stand-in moms and anyone else who had to be a "mom" in their lives. I hope you have the Best. Day. Ever. Great post :). I teared up a bit about John's mom, though :(. Thanks, Tim. I teared up writing it, so that's only fair, I suppose. Very well put. I don't have anything to contribute but I'm glad you found some great couches to surf all those years ago :) . I would have preferred that option to some of the other survival choices I had to make, lemme tell ya! Heck, even I remember the generosity and kindness of the friends you listed, and I only saw them each a few times in total. - Can't forget the first place I ever saw a "clapper" light activator, a touch-activated lamp, and entire crystal bowls filled to the brim with M&M's o'er the Rose's place. Magical! I would argue with your second sentence; your contribution to this post is wonderful and much-appreciated! I had completely forgotten about the bowls of M&Ms, although how I could forget that is beyond me. And boom, I'm back in the Roses' enormous lakefront condo, which I think is likely where you saw them (I don't think you ever got to the house on Dunvegan). I hope you don't mind me including you in this post - albeit briefly and in a kind of offhand way. I didn't want to make it sound like I suffered alone but neither did I want to be presumptuous enough to think I could speak for you as well. And the excellent word "challenging" in the second paragraph was Sarah's contribution to the post. I think it works perfectly. The picture was taken onthe Parkway East of Gananoque, at a rest stop.The St.Lawrence River is in the background. Oh wow, I would not have been able to guess that in a million years. Thanks for solving that riddle for me, Dad. What a powerfully written and moving article Steve. It wonderfully reflects your deeply felt gratitude and unparalleled sensitivity and thoughtfulness. I'm sure the lives of all the women you mention were and are greatly enriched by your presence and love. Thanks, Gav. I've never turned it around that way in my own mind for I've just been too grateful to have had them in my lives at all. It brings me great joy indeed to contemplate the possibility that you are right on the mark in your last sentence. I've kept my comments open and moderation-free for many years, but I've been forced to now review them before they post due to the actions of one member of my family. I apologize for having to take this stance, but that's the way the world is headed, sad to say. Thank you for your understanding. Passionate about empathy for animals. Passionate about mental health awareness. Passionate about nature. For a brief, shining moment I was able to combine all three passions...until the Toronto Zoo fired me as a Volunteer. No, seriously. That happened. Feel free to let them know how you feel about that any chance you get. Thanks. *not an actual penguin. Ashakiran – "Ray of Hope"
A Lazy, Hazy, Not-So-Crazy Day of "Summer"
My Own "Field of Dreams"
Test Drive Day is Almost Here!